Hey guys, I’ll get this colored soon but I hope you can understand why it took me a little longer! Coooooool, forging a sword! That’s gonna be a visual blast. I love watching blacksmithing at work! I dunno, they forgot some other key differences between Blanket and Skarvs. But sure, go with the sword! I feel last panel Floyd. All day, everyday. Part of me likes to thing Cammy is in some basement somewhere going over door damage during all of this and it makes me smile. Human facial features? It is that, right? Does Ecta really love to work that much, or does she just love to see her team suffer? Potential uses for numerous powerful swords are surprisingly limited. 5. Gilgamesh style blade wielding; dark magic to use every single sword at once for whirling blade pitcher style. Get some dark-magic powered armor on Skärva with that set up and you put Gannondorf to shame. 7. Some sort of focus item type deal, where you store world-ending spells in each sword and plant them around Idenau as a distraction while you forge the one sword to rule them all, which will cause 1-6 at the final fight, though not in that order. Oh wait it says ‘ores’ not ‘ones’. Did Skarva forget his take-down-the-gods plan, or is this just another distraction? This is a prequel, hence “chapter zero”. Also explains where Lorelei and Davis are… or rather, aren’t. There have been a couple people express confusion about this, so I might go back and put up an explanatory page before this story so people don’t miss what’s going on. 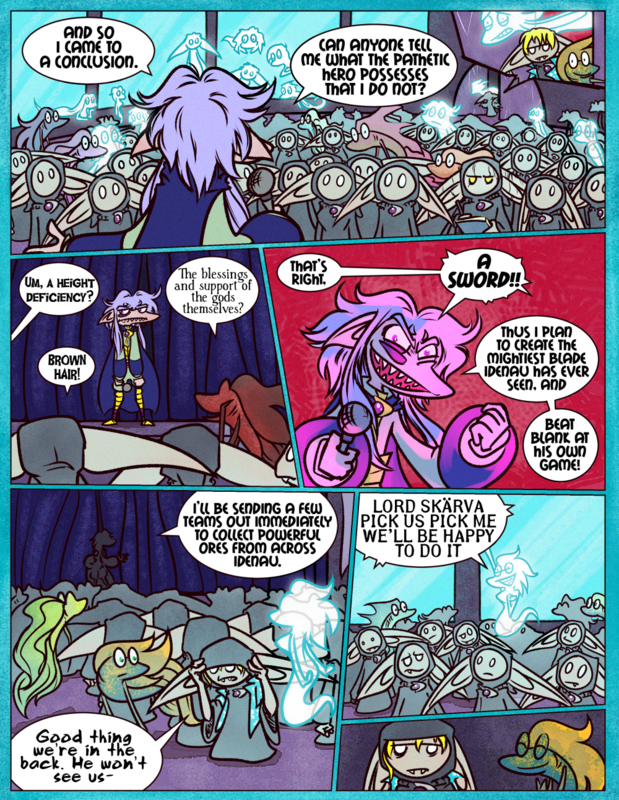 So does Ecta have some sort of crush on Skarva? I’ve been getting that kind of vibe for a while now. She just loves work that much. If work was a physical entity, Ecta would be all over it. However, this brings up some other, more interesting, uh, things. A DUCK. I’m sure he’ll doesn’t have a duck. they also float on water. I haven’t checked on the comic in too long, silly me.